From another cruise ship mishap to big banks finally free to return money to their stakeholders in a material way, here's a rundown of last week's smartest moves and biggest blunders in the business world. It was a good week for BlackBerry (BBRY) and Samsung. BlackBerry's stateside wireless carrier partners are now pointing to an availability date for its new Z10 smartphone for later this month. BlackBerry also announced that one established partner placed an order for a million smartphones. It's the largest single purchase in the wireless pioneer's history. Samsung also did some showing off at Thursday night's Samsung Unpacked event, introducing the new Galaxy S IV phone that once again raises the bar on smartphone features. Just as the jokes about Carnival's ill-fated Triumph sailing from last month were starting to fade, the world's largest cruise line is back to being punch line fodder. 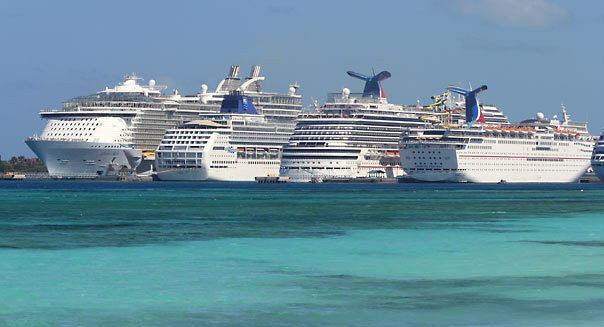 Carnival also nixed the Dream cruise that was supposed to set sail over this past weekend. Those passengers will receive refunds, a 25 percent break on a future weeklong trip, and reimbursements of any non-refundable travel expenses. Carnival may be doing the right thing, but it gives the cruising industry another black eye. But for vacationers, there is an upside: Last year's Concordia mishap created an opportunity to get a great deal on a future cruise. Look for another spate of similarly great deals to float along soon. It took nearly two years of lobbying, but Netflix users can now start automatically sharing what they're watching with their friends on Facebook (FB). It's not as creepy as it sounds. Subscribers have to actually opt-in to the feature, and any guilty pleasures can be checked off so they're not shared. Well, participants will see two new rows of recommendations on their Netflix streaming page. One will show titles that friends have rated highly. The other will show the most recent movies and TV shows viewed by friends. In short, users will get friendly recommendations as well as conversation starters the next time they run into their Facebook pals in real life. Folks still meet in real life. Right? An IRS tweak is leaving 600,000 tax filers waiting for their delayed tax refunds. A change in the way that the IRS handles claims for education tax credits on Form 8863 may hold up refunds for early filers by as much as six weeks. H&R Block took some heat earlier in the week, but it's just one of the many tax preparation companies that were blindsided by the IRS move that impacts those who filed for education credits before Feb. 22. However, the reason H&R Block gets singled out here is because it's already mid-March and the company's tax filing software -- H&R Block At Home -- still doesn't support Form 8936. Which form is that? Well, that's the form for tax payers to get $7,500 off their 2012 tax bills if they bought a qualifying plug-in electric vehicle during the year. At a time when gas prices are hovering around $4 a gallon, one would think that H&R Block would have updated its software the way that its primary rival did earlier this month. The "too big to fail" banks are finally starting to succeed. The Federal Reserve concluded its stress tests on the major banks and just two -- Ally and BB&T (BBT) -- were deemed fiscally wobbly. The rest of the banks passed and can now return more money to shareholders than the token $0.01 a share dividend that was previously allowed. The banks didn't waste a lot of time after the Fed's Thursday night report to initiate aggressive share buybacks and increase their payouts. JPMorgan Chase (JPM), for example, moved to increase its quarterly dividend rate to $0.38 a share and initiated a $6 billion share repurchase plan. Motley Fool contributor Rick Munarriz owns shares of Netflix. The Motley Fool recommends Facebook and Netflix. The Motley Fool owns shares of Facebook, JPMorgan Chase & Co., and Netflix. Try any of our newsletter services free for 30 days.